To kick off our anniversary week Stu and I went to see Debbie Reynolds in her Alive and Fabulous show at the Apollo Theatre in London's glitzy West End. I've not laughed at the theatre so much for ages. She was very, very funny. "Thank you for coming. No one here is under fifty. Not unless someone over fifty bought you. Anyway, it was nice of you to come and see me before I die." "I was born Mary." (Whoops from man in audience). "Oh, are you a Mary too, dear." "I won a beauty competition at sixteen - I wanted to win the first prize; a scarf and a blouse. I ended up getting a contract at Warner Brothers." "My first husband Eddie Fisher left me for Liz Taylor - she being three months older than me. I warned him that she'd dump him after fifteen months - and she did!" "I'm Princess Leia's mother - that makes me a Queen... (eyes front row)... are you all Queens too?" She showed many film clips such as 'Singing' in the Rain' and 'The Unsinkable Molly Brown' and sang along to all of the songs. She told a dirty joke: A woman was at a party and said, "If any one can guess what's in my hand they can sleep with me". A man calls out, "an elephant?" The woman says, "close enough!" She did a lovely 1940s melody and even did a rap to Three Little Fishes and did a bit of Beyoncé's Single Ladies (Put a Ring on It). Stu almost wet himself laughing. "How do I look from up there? ", she asked the balcony. "From down here (pointing to the front row again) I look like Lady Gaga." She did some spot-on impressions too; Mae West, Jimmy Steward, Ethel Merman, Katharine Hepburn and Bette Davis among others and regaling each with stories from her days in Hollywood. Nice to have someone take the piss who actually knew the originals. "Judy Garland and I were great friends. I'd put Carrie and Todd to bed and she'd put Liza, Lorna and Joey to bed and I'd go over to Judy's house for a drink. Then we'd wake Liza up and give her some!" Her impression of Barbara Streisand was something to behold though. She looked, sounded and joked just like her. And it was very, very funny. 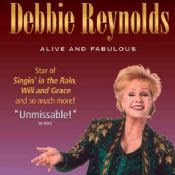 All in all Debbie Reynolds is a non-stop all-round old-school entertainer. Real show-biz, with all the razzmatazz of Hollywood. She obviously never wants to leave the stage. Always wanting to be in the spot-light. But it's a spot-light that casts a very long shadow. And I can't imagine how tough it must be having to walk in that shadow all your life (yes, I looking at you Carrie Fisher).